A flaky, warm bun houses braised, shredded meat in this Hebei Province specialty. In the Chinese cities of Baoding and Hejian, palatable pockets of shredded donkey meat, sometimes referred to as “donkey burgers,” grace menus at fine dining restaurants and street-side stalls. To lose its sinewy texture, donkey meat must be marinated and cooked for hours. Once properly prepared, however, it has a flavor that one blogger describes as “tender, sweet, and delicious.” Some cooks will mix chunks of fat or green peppers into the naturally lean meat, creating a uniquely textured, flavorful sandwich. Rounding out the satisfying snack are its signature warm, flaky buns. What shape these take depends on your location, as Baoding uses round bread, while Hejian tends to use rectangles. Regardless of where you’re tucking into your burger, rest assured the buns will be straight out of the oven. There are many competing theories surrounding the origin of eating donkey meat in China, with some sources tracing it back to the Ming dynasty. 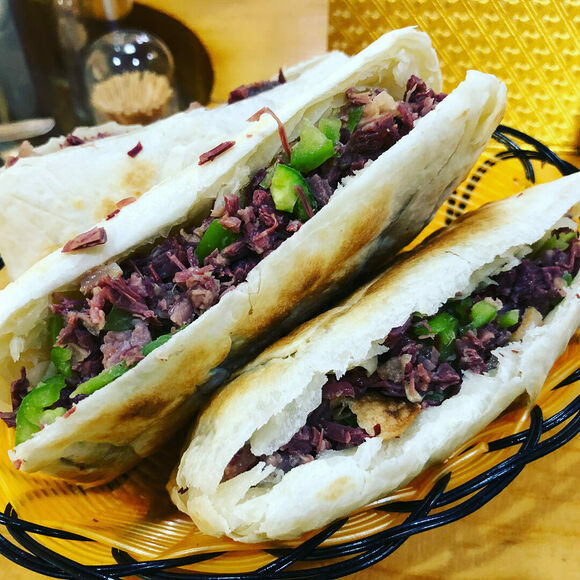 Regardless of how this sandwich came about, its popularity has grown beyond Baoding and Hejian, finding a home in the capital city of Beijing and throughout Hebei Province. In the wake of the 2016 American presidential election, political satire entered the local deli. Denmark's open-faced sandwiches are equal parts decadent and decorative. A circle of South Dakota towns specializes in these fried meat cubes.